Hey there Friday. Welcome back! I am so happy this week is le dunzo. I’m exhausted to say the least. Chip and Daisy received a piece of 3-foot-long beef jerky. This 3 foot-long beef jerky was so outrageously large that I splurged the $6 on it. I admit it was really more for my benefit than theirs. I still crack up about it. Happiest dogs I’ve ever seen. This week I was also alone as my husband was away on business. Oh, I kept busy alright. Daisy was spayed. If you’ve ever had a little sprite of a dog like a Maltese, you’ll understand why I’m so exhausted. They’re not supposed to jump on or off furniture, but she would do it in the blink of an eye. I had several mishaps in successfully putting on her cone. I finally just put on a hair clip and called it a day. She looked so pitiful after coming home from surgery, but Chip was comforting her. I also only slept through the night ONCE this week as Daisy had a horribly upset stomach and we would take 3-4 potty breaks outside. THREE to FOUR PER NIGHT. Not fun. This weekend also couldn’t come any sooner as there was bad stuff happening. It led me to making these phone wallpaper freebies for your enjoyment and to lift your spirits. Aubrey also made a Friday Freebie today that you will LOVE! Daisy and that cone. I just can’t! ahhh my pup had an upset stomach last night! :( was not fun! I called Brutus a ” Brutus Martini ” when he wore the cone of shame! Have a happy weekend, love bug! Awe, Daisy is just too cute! 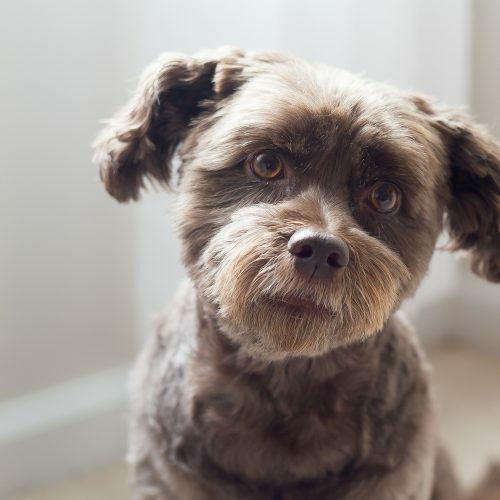 We have a Maltipoo and he looks a lot like her…and can even pull off that pitiful face too! I love it! Poor pup! Mine was just as pitiful (and babied) when he got neutured. Bahaha “I finally just put on a hair clip and called it a day.” and now Daisy looks fab. Love the picture of her and Chip though, so sweet! Pretty sure my dog would have a conniption over that jerky stick! Seriously loving my “reap what you sow” wallpaper, girlfriend. When we got our pit spayed she was the same way. I was like wait…aren’t you supposed to be out of it! Also..that stick..holy moly! Excellent song choice. It makes me feel like I should go out for a run! Oh my gosh my dogs would die over that jerky! Where did you find it? Your dogs are adorable, they remind me of my brothers puppy baby! So happy I found your blog through Treasure Tromp tonight! That 3 foot jerky is hilarious! My Yorkie Lucy would love it. And I’m sorry your Maltest was exhausting… we need to get Lucy spayed too, and I’m not looking forward to it because she loves to run and jump and go nutso! Bahaha that reminds me of the time that I bought Weiser a calf knee bone that was bigger than his head! Watching him go at it, was so worth the price!